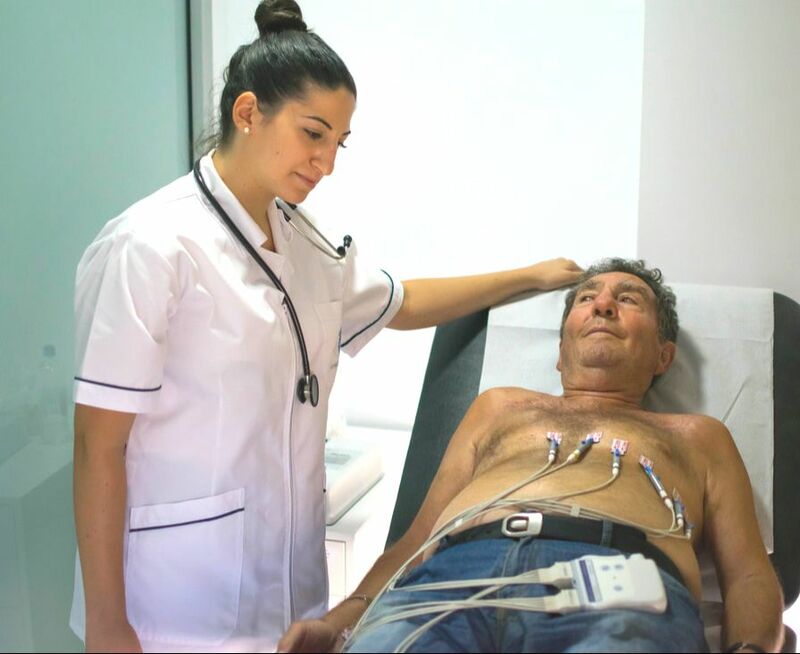 An ECG test (electrocardiogram) is a non invasive procedure that takes about five minutes to perform. The test records the electrical activity of the heart, giving the doctor information about the rate and rhythm of your heartbeat. It can also tell the doctor basic information about the size and shape of the heart, and the effects of certain medications that you may be taking. You will be guided to the couch where the test will be performed. The doctor will provide you with a gown, and ask you to remove your clothes from your waist upwards. You will be able to leave your shoes and trousers on, but ladies may have to remove their tights. You will be asked to lie onto the couch, on your back. The doctor will wipe your skin first, before placing a series of electrodes (stickers) on your chest and also on your arms and legs. A wire will then be connected to each electrode as in the picture to the left. It is important that at this point you remain still and breathe normally. You won't feel any pain or discomfort. After about twenty seconds the doctor will have a print out of your ECG ready for him to interpret. You will then be able to dress whilst the doctor interprets the results. Once you are dressed, the doctor will be able to inform you of the results of your ECG test. This may be the only test that you need to have. If your ECG result indicates to the doctor that other tests are needed, he will explain this to you, and what information these tests will provide.